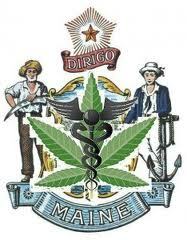 AUGUSTA, Maine — A bill to ease Maine’s regulations on the medical use of marijuana faces a legislative hearing. The Committee on Health and Human Services holds its hearing Monday. Supporters say it expands and protects the rights of patients and caregivers. The bill sponsored by Republican Rep. Deborah Sanderson of Chelsea would eliminate a requirement that patients register with the state. It also would take the decision about whether marijuana is appropriate in a given situation out of the hands of the state and let doctors decide. Sanderson’s bill would also prevent cities and towns from placing unreasonable requirements on caregivers and patients. A separate bill unveiled last week would legalize personal use and private and commercial cultivation of marijuana, and tax consumer purchases at 7 percent. Hash fire in Nova Scotia!